This Country Chic Designer Sink Cabinet has a gorgeous curved brown marble counter top that surrounds a rich antique brass finished sink and faucet. 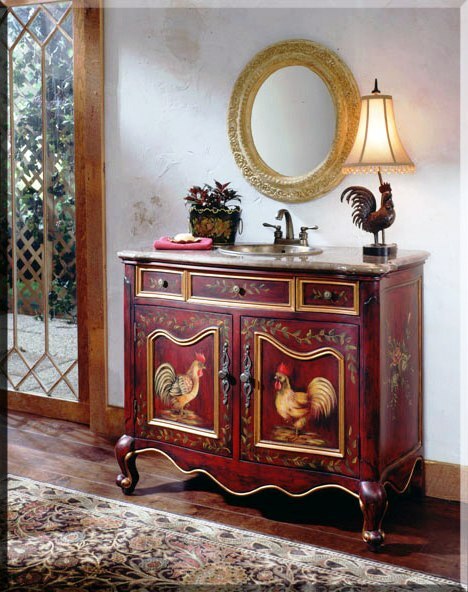 The finish is a barnyard red that has been hand applied to give an antique demeanor. Our Country Chic Designer Sink Cabinet has a gorgeous curved brown marble counter top that surrounds a rich antique brass finished sink and faucet. The finish is a barnyard red that has been hand applied to give an antique demeanor. The front cabinet doors have a cut away decorative shape and a double edge trimmed is applied to frame the attractive space. The inset panels are then hand painted with original country motifs and all around the outer frame a free form leaf vine adorns the rest of the door. The double edged frame is repeated around the edges of the top three drawers and the leaf vine repeated around the drawer pulls. A beautiful floral bouquet is carefully painted on the side panels. The bottom construction has a wave curve design that compliments the curve of the decorative shapes in the front and all the edging has been painted in a striking gold to showcase the beautiful shapes and curves of this country chic sink cabinet. FREE SHIPPING & HANDLING ON THIS ITEM.